Throughout the process of developing my SiP, I have become increasingly interested in language. This stems from my professional practice in art spaces and projects that I have worked on in the past. for the most part, taking things at face value is uninteresting to me, however in the position of researcher I hold this with a view to attempt some form of objectivity. whether it be syntax or tonality, I find myself wanting to read between the lines when reading text or conversation, this extends itself to looking at body language. The latter supports creating a full narrative. in some obscure way, it perhaps mirrors some of the themes I want to explore in terms of better understanding. This interest in language and the way it is used will hopefully be useful in drawing parallels between the group and the context that I observe and the movement that I make reference to. 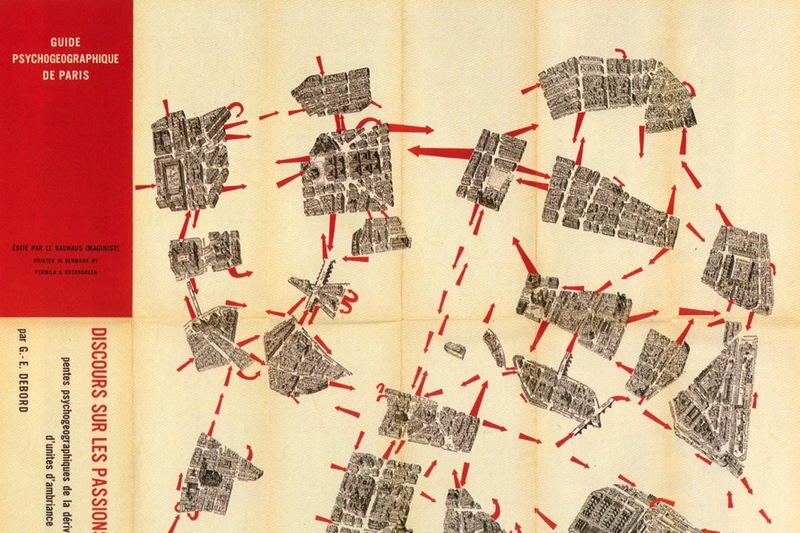 Psychogeography is commonly associated with Marxist Guy Debord and is thought of as an act of exploration of urban environments and offering the space for analysis of emotions and the behaviours of people moving through those spaces. 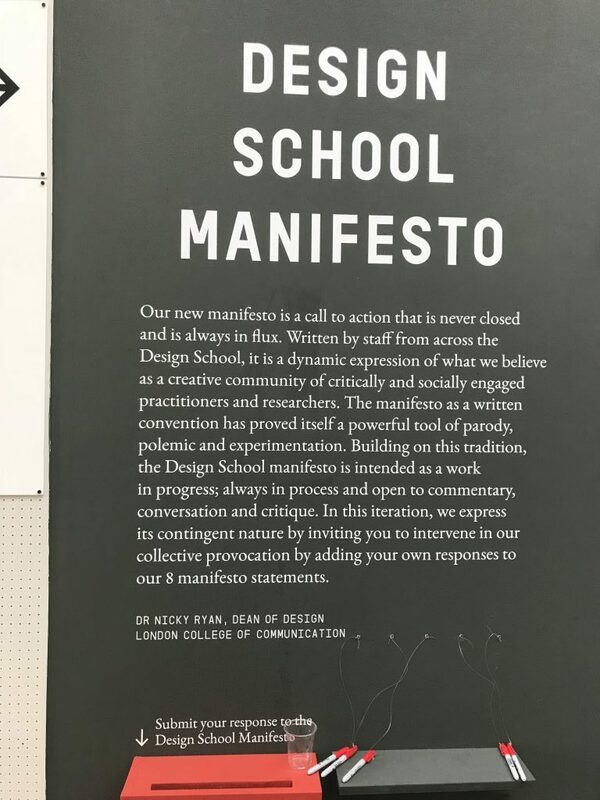 In looking at the manifestos in and around the London College of Communication building, I thought it important to revisit the Bauhaus manifesto. 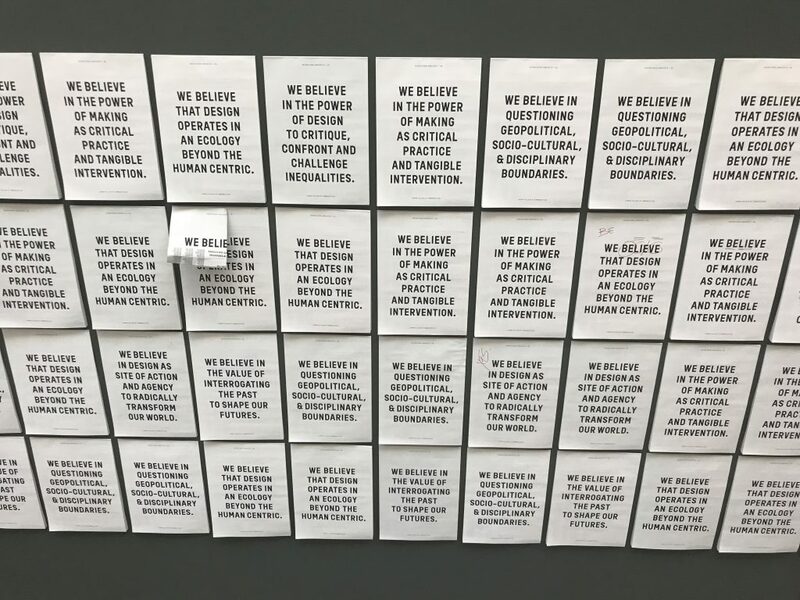 Manifestos seem to be key in galvanising behaviour, acting as a call to action which often informs movements. There is something utterly attractive to me about the concept of collaboration. However, in further reading that I have started to do, I am now questioning my earlier thoughts where collaboration and unity are synonymous. However, I want to pick out keywords that I would like to explore and highlight within my project. 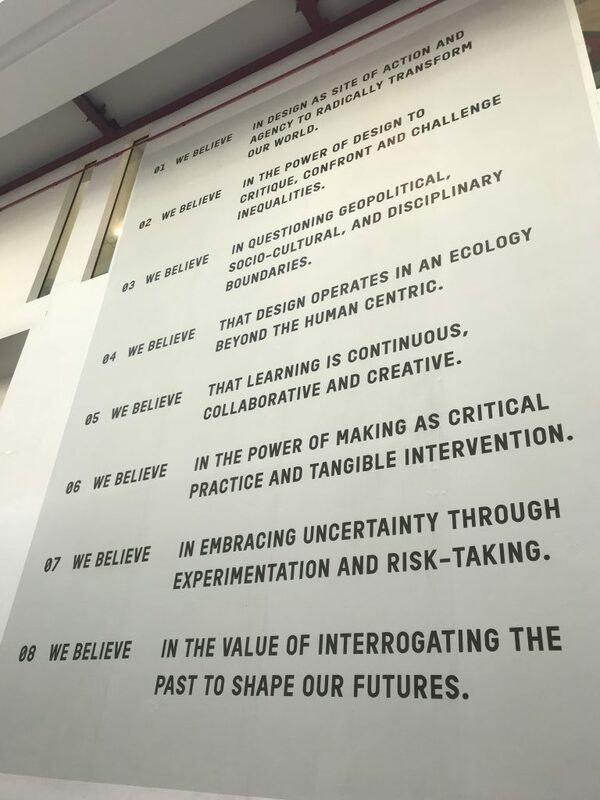 The selected words seem necessary in the context of describing and understand what and how the art school exists. I had numerous conversations with artists and practitioners and wanted to know why they went into teaching. What did this group of people feel like they stood to gain from pursuing such a career? This line of questioning came from a period of self-reflection as I continued to clarify to myself my reasons for teaching in its various iterations but I suppose I was much more curious to explore whether teaching felt like a second choice to them. I spent a few weeks thinking about this and how I would possibly explore this. I began to take an interest in psychogeography which is the exploration of urban environments through walking as I had previously attended a talk/workshop which explored how the use of similar methods had supported groups who used this to feel more comfortable in sharing thoughts, ideas and conversation. At this point, I knew I wanted to explore this as a possible methodology but I still wasn’t sure how I would manage to make sure it felt relevant. A trip to Berlin in mid-September refocused my attention of a previous and still very relevant interest of mine, Bauhaus. As I have a background in Architecture and Design I started to think more and more about the effects of space and whether or not spaces impacted on the learning that took place in those spaces. I wanted to ask more questions about this. the question around how I would rationalise this was still unclear to me. During this trip, I visited the Bauhaus Archive as the museum is currently shut and due to reopen in the next few years. 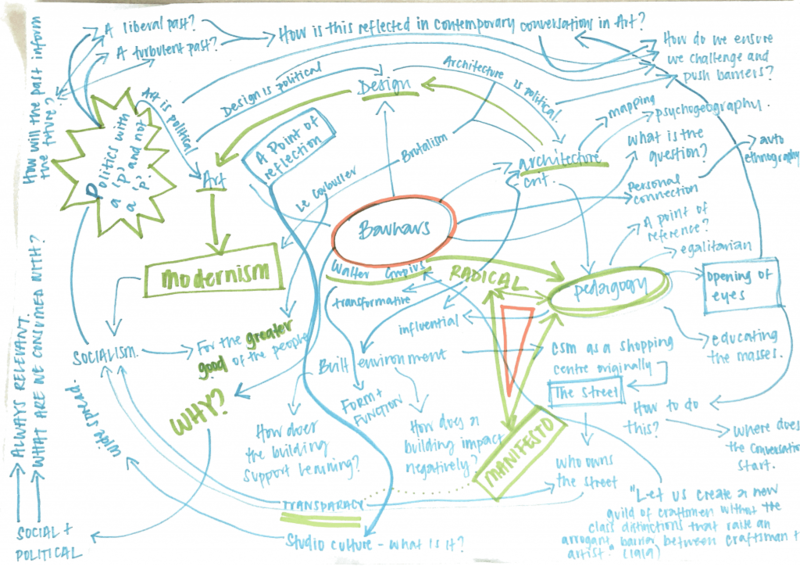 I saw images and texts that caused me to ask new questions supported by our concept mapping in the first SiP session. 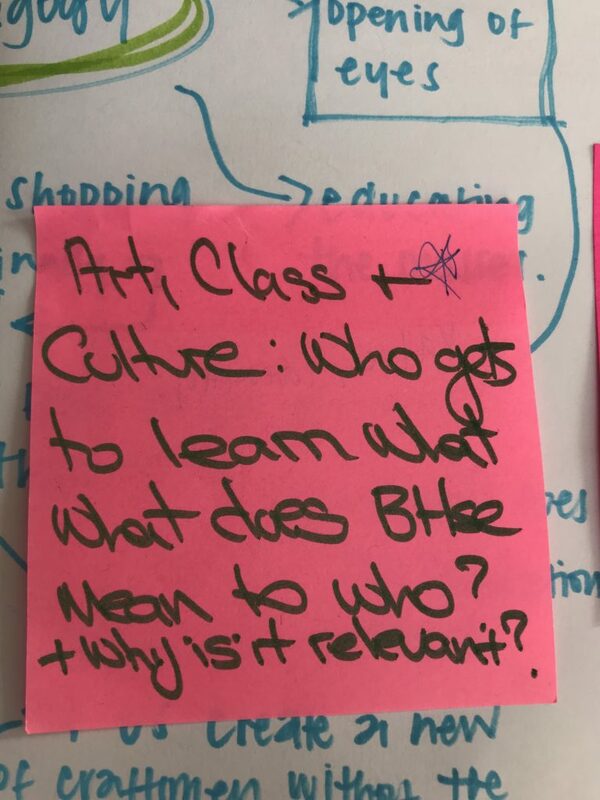 The questions continued to come and it was through conversations during my PBL group sessions and conversations with colleagues in my work with art museums that my question started to become more focused. I realised that I had many ideas but writing them down initially was very difficult as I had many strands that I was thinking about. In another PBL session, I shared my interest in exploring an incident which I now refer to as a critical incident as it was a catalyst in developing my question as it is currently and will continue to be. I had started to identify that every time I looked into Bauhaus it was often referred to as “radical”. Lucy shared the phrase “realities of the radical” which I was really excited by and felt that it framed my area of interest really well, later that week I was able to come up with the latter part of my question. Our second week for the SiP unit focused on exploring the various methodologies/methods we might employ to explore the questions we want to ask in our small scall inquiries. It is now clear that the unit itself is more concerned with the methods that will be used which in many ways will test our criticality through our choice of method and our ability to justify/rationalise the appropriateness of the said method. A single source enquiry into an organisation, situation or person. It is often associated with business studies, often attributed to Robert K. Yin’s approach. An internal detailed understanding to get a view of a specific scenario. Defined when art practices came to be submitted as research in an academic institutional context. Heuristic ie practice in knowing/learning in doing. Practice-based research relates to an artefact being the basis of how knowledge is gained. A subjective enquiry to identify an issue/problem/area for improvement in an area of practice. Environmental in being contained within an existing organisational or bigger system, emphasis on action as a means of improvement. studies carried out in the course of an activity or occupation, typically in the field of education, to improve the methods and approach of those involved. In thinking about how I might like to incorporate architecture into my research I have been reading Experiencing Architecture by Steen Eiler Rasmussen. The book was initially published in 1959 and remember it being on a reading list of books whilst a student of architecture so felt it an important book to go back to especially in the context of how people use and view space as I have been hoping to explore. In returning to this book I have started to highlight sentences that existed in my sub-consciousness and themes that seem to float around on a daily basis without taking the time to sit down and truly reflect upon. The above are some of the first sentences on encounters upon reading the book. They really frame many of my values and link back to many of the ways of thinking and doing explored in the Bauhaus school. Exploring the idea of what it is to experience. The definition is interesting because we often talk about the idea of the shared experience which allows for a certain level of relatability to take place and for conversations to form which again I think are important elements of an egalitarian learning environment and so raises questions about parity. Further ahead in the first chapter Basic Observations Rasmussen explores the concept of conformity. This is interesting in thinking about what it means to collaborate and how the various parties involved each contribute something very individual but the realisation that there is an element of conformity which leads and supports a groups efforts to their creative problems. He talks of people who come together for a common purpose trying to ‘appear as much alike as possible’. The latter is interesting because it also begins to relate to the identity and persona of a building. 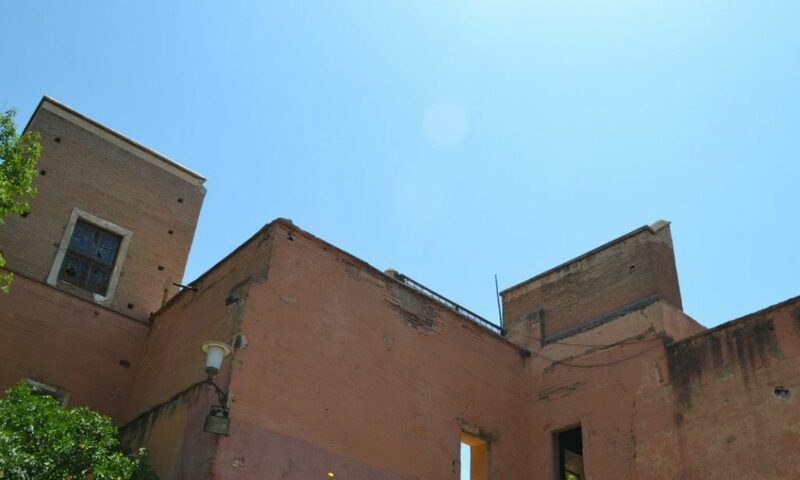 We start to think more and more about how a building could possibly exude conformity. In the context of the art school and thinking about how all students perhaps try to present themselves as individuals whether it be through how they present themselves externally or how they express ideas and emotions there is no escaping the idea of collective, commonality or conformity. Over the past few weeks, I have been greatly interested in the contribution to the London Design Festival by LCC. Everything Happens So Much takes place at the college between 15 September to 17 October 2018. To me, there is a sense of magic in the construction of the manifesto. it is a call to action and often helps to build and develop a sense of community in whichever context it lives within. 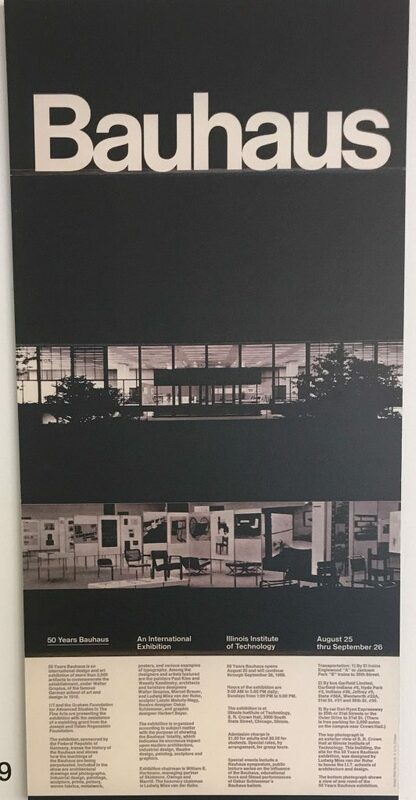 Seeing the posters in and around the building reminded me of what it was like and why I opted to go to art school. As young designers, artists and alike there is a desire to solve the problems of the world one by one through their chosen discipline. The concept of the manifesto will be very helpful in supporting the development of my questions for the interviews I will conduct and further thinking about how I explore further questions around the merging and collaboration of disciplines. 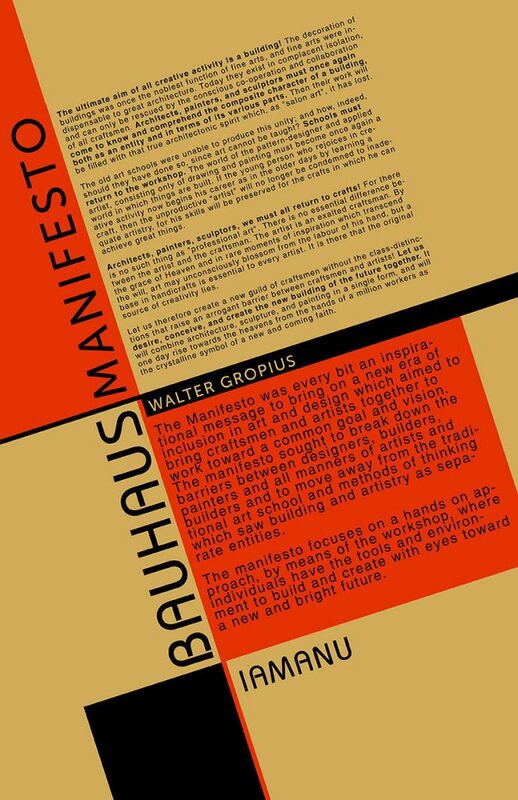 I plan to revisit the Bauhaus manifesto and pull out central themes and ideas for further exploration. In researching points of reference for the development of my SiP unit I came across this wonderful video of Josef Albers whilst teaching at Yale. Josef Albers was an artist and educator who was born in Germany but lived out his later years in America. It is said and widely acknowledged that his work across the United States and Europe ‘formed the basis of modern art education programs of the twentieth century’. Importantly to me, Josef Albers was a student at Bauhaus and was asked by Walter Gropius (Founder and then Director) to later teach at the school. After the Nazi pressure forced the school to close in 1933 Albers moved to the US and became the head of Black Mountain College, a new art school in North Carolina. In 1950 Albers left and became head of the design department at Yale University which is what the video below depicts. I accessed this video on the Josef and Anni Albers foundation website. His wife Anni is an equally important figure when thinking about Bauhaus and as a matter of interest and a way to understand the culture of the school I will be visiting the exhibition on her work at Tate. Although a silent film it was beautiful to watch. Looking at the active approach Albers took to teaching his class and thinking about how I may go about implementing such in the way that I teach coupled with the positive approaches that I have already established in my practice. After what felt like an age, but equally a long time coming we resumed this week with an introduction to our Self-initiated Projects. Since starting the PgCert at the start of the year this is the unit I have been looking forward to most. It offers a space for me to ask questions and explore methodologies that I have encountered over the summer and will continue to do so over the coming month. Thinking about my subject/question of choice has been a difficult one. over recent years my sentences have increasingly started with ‘why’ or ‘how’ in search of an answer that goes some way in starting a lengthier dialogue which increases and expands my bank of knowledge. Since starting this journey teaching in HE environments I have learnt much which has gone a long way in helping to analyse and compartmentalise my own personal experiences in art school. after a few experiences over the summer, I have increasingly become fascinated with a question “why teach?”. We all understand the importance of teaching – when done in the right way and what it can afford the students on the receiving end. But taking into account that one size does not fit all when it comes to teaching large quantities of students I am also interested in the motivations of the individuals who set about imparting learning, or better so, creating a shared learning environment. As part of the pre-session task, we were asked to fill out a form online outlining details about our current teaching practice/context and the initial ideas that we had alongside some links from readings, videos and photographs to provide context for these ideas. I feel that I struggled with this initially as I had many ideas about what I would like to explore alongside a multitude of methodologies which I wasn’t quite sure how they would all come together to form a coherent enquiry. As an undergrad student, I had always been fascinated by modernism. The German school of Bauhaus stood out like a beacon of what we might want to achieve in arts education. On countless occasions, Bauhaus and the word radical have been linked in the same sentence which is still relevant in the context of the modern day art school and how we continue to use art as a tool for having difficult social conversations. My initial worries about how things would come together and what area I would focus were quickly countered through conversation with those in my PBL (problem-based learning) groups and sharing my ideas out loud. I quickly realised that I had quite a clear idea of what I would like to focus on which was the school of Bauhaus and its pedagogies. 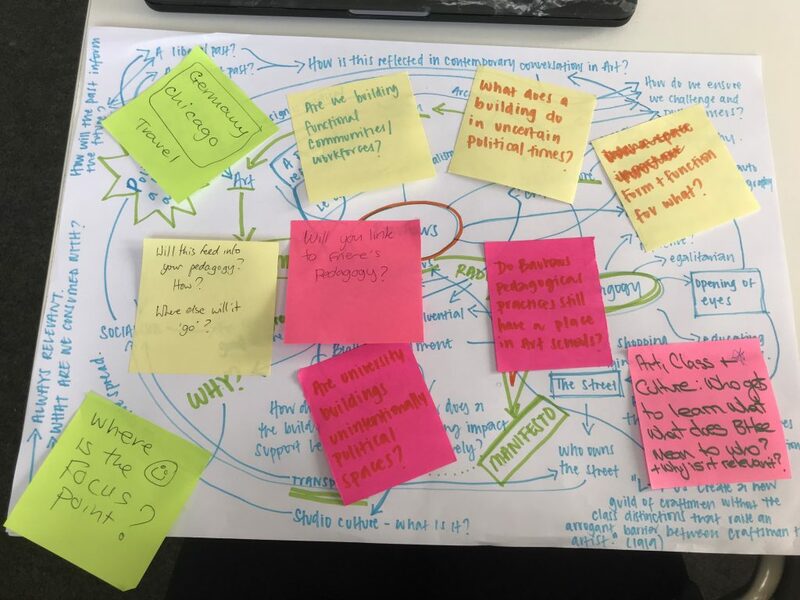 During the session, we were encouraged to create a context map which started to expand and explore the central themes we may have been holding to start the process of formulating questions. I found this process extremely useful as it freed up space in my mind to continue to make more connections and ask additional questions. It can often be difficult to hold multiple trains of thought in the mind and contextualise it. We were asked to think of initial questions before being asked to move around the room and view the other maps that people had created, have conversations and leave questions in response which was also helpful as many people had additional points of references and helpful resources to expand the search. However, this comment below was one of most significance as it prompted me to think about the origins. no matter how well known we may believe something to be, there are still many out there who aren’t aware of the school of Bauhaus. This is something that I would like to explore further – does it matter that people don’t know what Bauhaus is? is Bauhaus still relevant? How would you describe your own identities; such as gender, ethnicity, religious beliefs and so on? Would you say that your identities have changed over time? If so, how? The incident outlined in the embedded video was one that caused me great concern and caused me to think about how as teaching staff/academics we may go about creating safe spaces for students to explore other identities/characteristics they do not hold. This is of great interest to me in devising methods to support this as I feel that my teaching practice moves in the direction of encouraging students to challenge an ask questions – however it is vital to ensure that boundaries and respect are given to all those involved in any form of discourse. Moving forward I would like to research into theories that support and help me to better understand this area of teaching practice that I seem to be moving towards/drawn to.